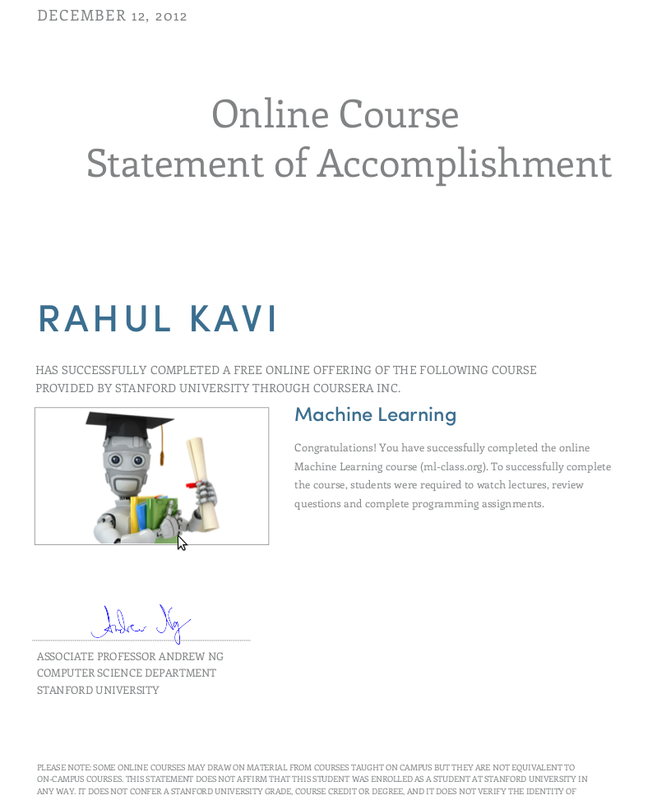 Late last year, I finished Andrew Ng's course on Machine Learning in www.Coursera.org. It was absolutely wonderful. I have learnt a lot from that course. I got a perfect score of 100%. Finally, I overcame the procrastination to learn to program in Matlab/Octave effectively. I felt very comfortable in dealing with Octave. Previously, I thought Octave had very less features compared to Matlab. It is kind of true. But, you could manage writing code that could solve complex problems without spending much money on a Matlab License. Know how(theory) of using certain optimization algorithms on Map-Reduce. My background in Pattern Recognition did definitely help in it. I was working in a related area of research, it helped in finishing my Master's Thesis too! Now I'm pretty confident on taking on any ML problem/assignment. Now, I have time to complete other interesting courses such as Probabilistic Graphical Models and Neural Networks for ML. Thanks Dr. Andrew Ng and Thank you Coursera! And yeah, this my certificate. Congratulations Rahul, on your accomplishment.